At last! 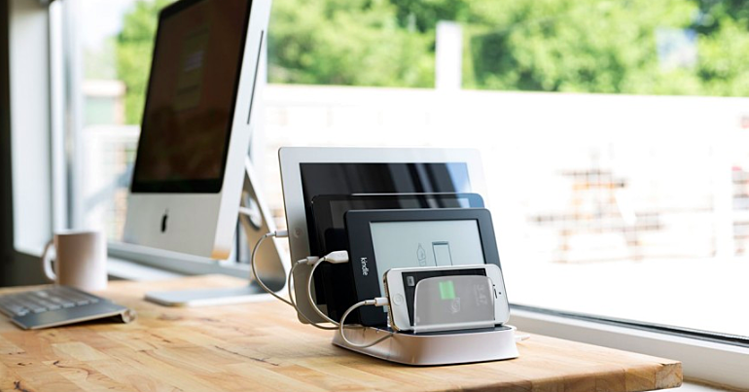 A charging station that looks stylish, gets rid of desk clutter, and accommodates the whole team. VoicePlus now stocks the Griffin PowerDock 5. 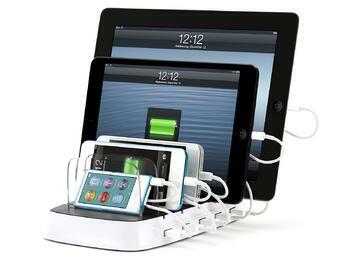 The PowerDock 5 is a stylish, space-saving charging station for up to 5 devices. 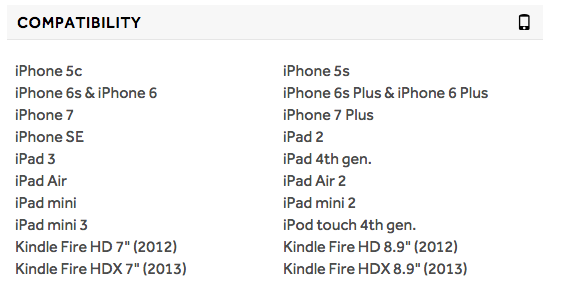 Taking up about as much room as an iPad, it stores and and charges 5 iOS devices at one time, from a single power source. PowerDock 5 is optimised for iOS devices (iPad, iPad mini, iPhone, iPod touch, iPod nano), although testing shows it works just as well with Microsoft Surface and Samsung Android devices. The PowerDock delivers 10 watts 5V (2.1 amp) to each dock simultaneously. What also seperates the PowerDock 5 from other smart chargers is the little plastic dividers on top of the unit. PowerDock 5 gives each device its own charging port and its own frosted backrest, and each charging bay is roomy enough to accommodate your iPhone, iPod or iPad in their cases. The only downside is the unit does not come with any cables so unless you have nice short cables of your own it may not look as tidy as these images. Also the cables can not be locked down, so if you have an office cable 'borrower', cables can still walk.